There are a lot of cool things going on in this recipe. First, the shrimp get tossed in cumin, paprika, and garlic powder, which gets them nice and spicy and gives them TONS of flavor. Next, you're making a spread of creamy sour cream, spicy chipotle, and cool lime. Not to mention that you're also whipping up a pineapple avocado salsa—that you should just go ahead and make extra of, because you will want to put it on EVERYTHING. And last, all of this goodness goes on a piece of jicama that is sturdy yet flexible, and adds another layer of freshness and crunch to the dish. And because it’s really just a slice of jicama, it takes almost no extra time. You could use these components separately in lots of dishes this summer, or you could combine them all and make the most outrageous tacos—that are actually crazy healthy for you. Whatever you do, you are eating good tonight! In a large bowl, combine the pineapple, avocado, red pepper, lime juice, cilantro, and salt. Mix together and set aside. In a small bowl, combine the sour cream, lime zest, chipotle puree, and 1½ teaspoons of the salt. Mix together and set aside. Peel the jicama and cut it in half widthwise, creating two circular pieces. Place one of the halves on a mandolin cut-side down and set the mandolin for about 1/12 inch-thick slices (You should set the dial between ⅛ and 1/16, but closer to the 1/16 mark.). Your slices should be thin enough to bend without breaking, but thick enough to hold the filling. Also, if the jicama is too big for your mandoline, trim one of the sides until it fits. 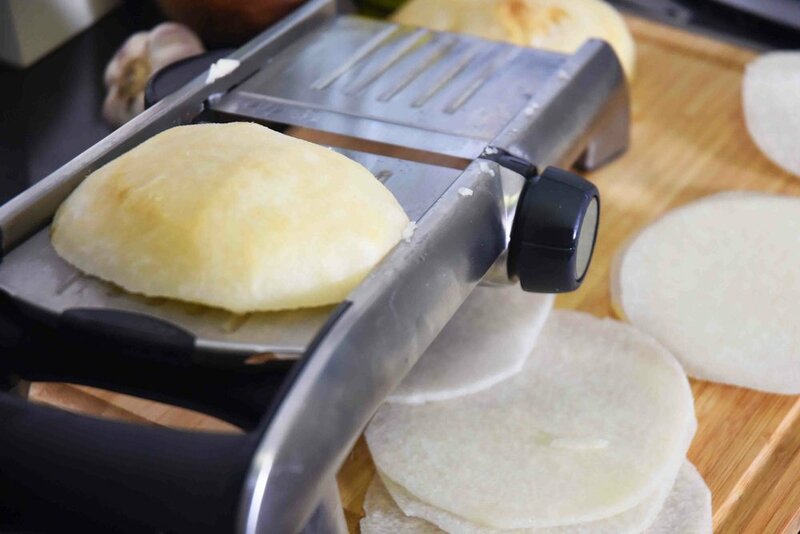 After slicing the jicama, you should have about 20 “taco shells” (the extras can be saved for up to a week in the fridge). Discard the ends or use for another purpose. Heat a large skillet over medium heat and add the oil, cumin, paprika, garlic powder, and the remaining ½ teaspoon of the salt. Cook the spices for 1 minute, then add the shrimp and cook it until it is pink and cooked through—about 2-3 minutes. Note: You can cut the shrimp in half prior to cooking if you prefer; the smaller the shrimp, the better they fit into the jicama taco shell, which also makes the taco a little easier to eat. Place the jicama shells on plates and sprinkle each with a touch of salt. Next top with the sour cream mixture, then the shrimp, and finally the Pineapple Avocado Salsa. Garnish with extra cilantro if desired. You’ll find chipotles in adobo in a small can next to your taco fixings in the supermarket. A whole chipotle pepper is generally too spicy for a recipe, so I take the whole can and puree it in the food processor or blender. Then you can measure out what you need. Store the remaining puree by placing in the bottom of a Ziploc bag and allowing it to freeze like that so you get a log shape. Then just slices off as much of the frozen puree as you need in the future.